Bail and bond funds can be an important tool towards dismantling the prison industrial complex and ending mass incarceration. However, as many new funds emerge in response to the rampant policing of protests and uprisings, this is an important moment to share lessons learned on the ground. Lawyers and legal workers sometimes create the funds without establishing a direct, accountable, intentional connection to the communities in which they exist causing a disconnect in strategy and desired outcome. 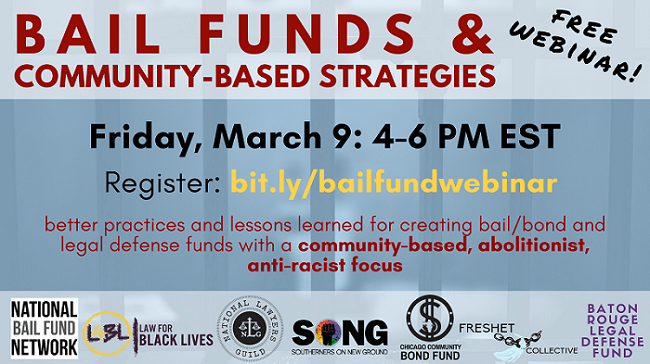 Join us for this free webinar, March 9, 4 PM-6 PM (EST) that will feature volunteers from bail fund groups in Baton Rouge, Standing Rock (the Freshet Collective) and the Chicago Community Bail Fund to explore some of these tensions while uplifting some concrete victories. Law for Black Lives, the National Lawyers Guild and the National Bail Fund Network will offer a framework in which bail and bond funds are connected to community-based organizations with a focus on racial justice and eventual prison abolition. Southerners on New Ground will discuss their recent National Mama’s Day Bailout Action and how we can move forward together..
Posted in Announcements and tagged anti-racism, cash bail, Mass Incarceration, Prison Abolition, Webinar.